We’ve teamed up with 21 other independent UK festivals to help raise funds and awareness for France’s refugee camps. 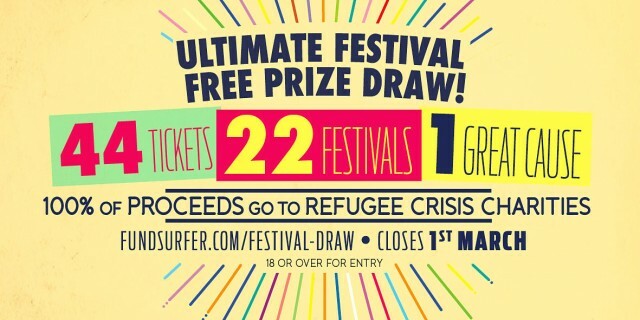 The Ultimate Festival Prize Draw is offering 22 lucky entrants the chance to win a pair of tickets to one of the festivals for a donation towards the cause. The bulk of the funds raised will go towards Aid Box Convoy: Bristol – refugees in Grand Synthe project. Where the team have been supporting Medicine Sans Frontiers and other volunteers to help keep thousands of refugees alive through the winter months in one of the worst camps in the region due to restrictions placed on them by the authorities, many are struggling to meet even the most basic needs. Aid Box Convoy was started by a passionate group of people from Bristol, many of whom have ties to the festival industry, ABC have been on the ground delivering and co-ordinating aid to get to the people who need it the very most in the smaller camps in Northern France since Early October. ABC’s work has been instrumental in keeping many of the now 3,000 displaced refugees alive in the camps they operate in throughout the winter. Appealing to the local councils and politicians to support the camp, as well as providing a consistent presence of volunteers at the camp who respond to the refugee’s basic needs and co-ordinate vital supplies such as arctic sleeping bags, wood, building supplies, fuel for the generator and many other sources to help provide basic levels of human rights.